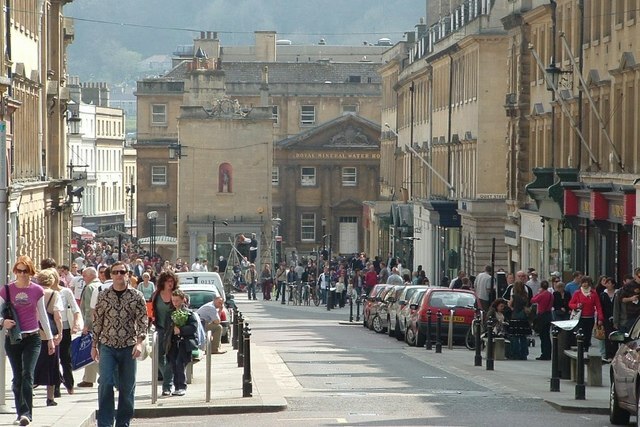 I felt immediately at home in Bath when I arrived a few years ago to take summer classes. As an English major, I would hope it is fairly obvious why I would be going to Bath to study – one writer by the name of Jane Austen. I am, without a doubt, a voracious reader. And interestingly enough my literary tastes trend towards classical literature and philosophy…or YA and genre lit. Not much in between. And I own over 1300 books. That’s a lot of classics. Contemporary literature doesn’t appeal to me much; perhaps because I’m spoiled by the rich prose in older literature, and don’t wish to try my luck. But enough raving about books (I’d go all day if you let me) – back to topic! Bath! Much like where I went to college (or uni for those in the UK) Bath was a tourist town come the summer – and had springs. Part of my acclimation to Bath was that after, oh, ten days, I would start muttering about the “silly tourists” who were crowding up the cathedral square. The house that I was staying in was not far from Prior Park, which is probably one of the most beautiful and rambling estates that I have seen – very British, and I loved it. When we picnicked on the Royal Crescent or at Victoria Park, I got taken back to the heyday of Bath – and I could see the elegant ladies in their dresses and the men in their formal wear, taking their carriages to take the waters or go to the Assembly Room. It was the perfect atmosphere for learning Austen’s literature – I could actually see the setting that Austen was capturing and explore it myself. I think it was the Georgian architecture that made Jane Austen and her novels so…present for me when I was studying in Bath. Though I would hate to be one of the removal companies coming to Bath to move someone in – or in fact, in any of England. Part of the reason that the literary great’s novels were still so present in Bath is because not much has changed since the time the novels were written. Which means very narrow roads and odd turns, and many alleyways that it’s hard to get more than three people walking across. I don’t envy anyone moving to (or from) Bath with a lot of stuff. One of our classes was actually a walking tour of Bath, and we went through all the locations and parks and strolls that were mentioned throughout Austen’s novels. So when Persuasion mentions that Anne Elliott realizes in a shop on Milsom Street that Captain Wentworth has come to Bath, I know exactly what she’s talking about. I can picture it because I’ve been there, and I’ve shopped on Milsom Street! I have a map of the novel right it front of me. It’s quite a surreal experience, especially as Persuasion is one of my favorite Austen novels, and is mostly set in Bath. And no good Austenite would fully explore Bath without taking a turn around the Assembly Rooms. Seeing the dress of the time – as a girl – it made me wish I lived in the past. Though as I found out later – corsets are not comfortable. (For those who have not been to the Assembly Rooms, you can try on various modern versions of the corset towards the end of the exhibit). The grand Assembly Rooms themselves were spectacular, and I’m sure were even more so with all the swirling dresses and finery on the floor. There was a nostalgic finery and formality in the air as we were painted a picture of what the Assembly Rooms were like when Austen attended. I could not have wished for a better experience in Bath – though the summer I was there was one of the rainiest on record, and one of the most expensive summers of my life due to the currency conversion rates, I wouldn’t change it for a thing. Jade Evans is a freelance writer who wishes that she could return to Bath – though with all of her books, she’d need one of the best removal companies around – or perhaps the strongest men. She’s been a writer all her life, but has only been doing it professionally for the past four or five years.